All that for way less than a hundred bucks! eBay, you foul temptress. We are a company of geeks. Apart from myself and a few others, pretty young geeks. We don’t know how to feed and clothe ourselves, let alone look in the mailbox. HR is not here on Saturdays or Sundays, therefore, the mail got left outside. It’s a fairly sad situation. A couple of hours later, and much to my eternal chagrin, Bee came trundling back up to my desk, arms laden with small packages. She unloaded them on me, looking askance. “Um,” I said, groping for any plausible reason I might have had 800 packages delivered to our business address. “Christmas shopping!” She seemed satisfied with this answer, said something about almost not having been able to carry them all, and off she went. It wasn’t a lie, per se – they’ll be made into Christmas presents, a lot of them. I’m a bit disappointed with the Mill House dessert roll – it’s all only polka dots. I love polka dots, but I had expected, I guess, more variation. Of course, I had to think of Lisa when I unrolled it. 🙂 Also, it’s apparently really hard to find Kansas Troubles Snow Blossoms stuff in anything but yardage. Naturally, that’s what I picked for the quilt I plan to make my mother (it’s bound to be a difficult process, through and through, and the end result may well end up burned, shredded or at the Goodwill after I give it to her… but I look at it as a Buddhist sand mandala – an exercise in the transitory nature of material things. 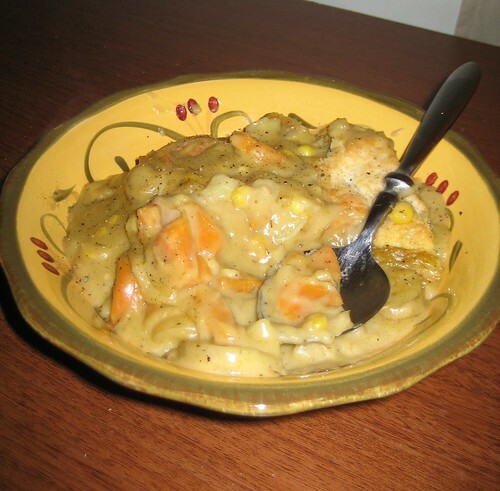 Before I became vegetarian, my most favorite comfort food was chicken and dumplings. When I gave up meat, I lamented I would never again taste such yumminess. Of course, that was just silly and I had a lot to learn. It’s not the chicken that was my favorite part – it was the delicious, dense, moist dumplings. While I still haven’t found anything that’s absolutely a fabulous substitute, there are a few things out there which give me solace. This is a variation on Ina’s Chicken Stew with Biscuits. It needs more tweaking, but it’s pretty tasty. I subbed potatoes and sweet potatoes for the 6 cups of chicken. I didn’t have any peas or mushrooms, and it really could have used them. I used sage instead of parsley, and lots of freshly-ground black pepper. Over all? Not bad. Of course, in terms of happiness, an amazing boyfriend, an awesome dad and stepmom, great friends, two fabulous dogs and a wonderful house out in the country don’t hurt, either. Hey, I found the Downey Quilts For Kids site today and it looks cool. 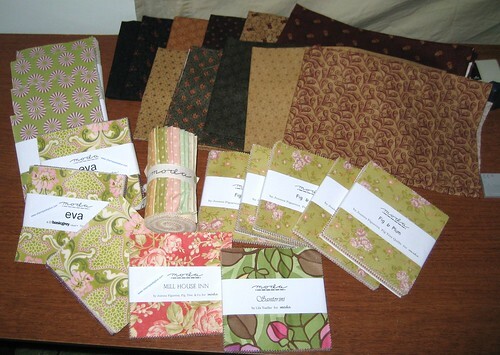 You can make a crib sized quilt out of your own stash and mail it to them, OR you can click the “Request a Kit” link and they will send you everything needed to make a quilt except for the batting! The ladies I heard about it from are receiving their kits in 2 days! So I signed up to receive one today. Oh! And I made your homemade gift for the swap… email me your address and I’ll mail it out! Jazzy! I’m amazed you’re reading a quilting blog, young man – but so happy to hear from you!! Proper college? Are you out of the house, then? Yay! Go team. Lis – I ordered one of their kits and got it in just a few days a couple of weeks ago… but I haven’t started it yet. I really need to do that!